Cooler Master, an industry leading enclosure, thermal solution, peripheral, and accessory manufacturer, today announces three new complementary products to assist in making your increasingly mobile lifestyle more fulfilling. Built to be a seamless protective accessory, the Wake Up Folio acts and a smart cover for all sides of the iPad™ 2. A microfiber inner lining ensures that your tablet remains secure while the premium build quality of the exterior protects against scratches and scuffs from daily use. Instantly put an iPad™ 2 to sleep and save battery power by closing the cover on the Wake Up Folio. Work will resume as normal when the case is reopened. This smart and power saving cover also functions as multiple viewing/typing angle stand for when you need to get work done, watch a movie, or create a more comfortable position for long periods of gaming. Click here for more details. 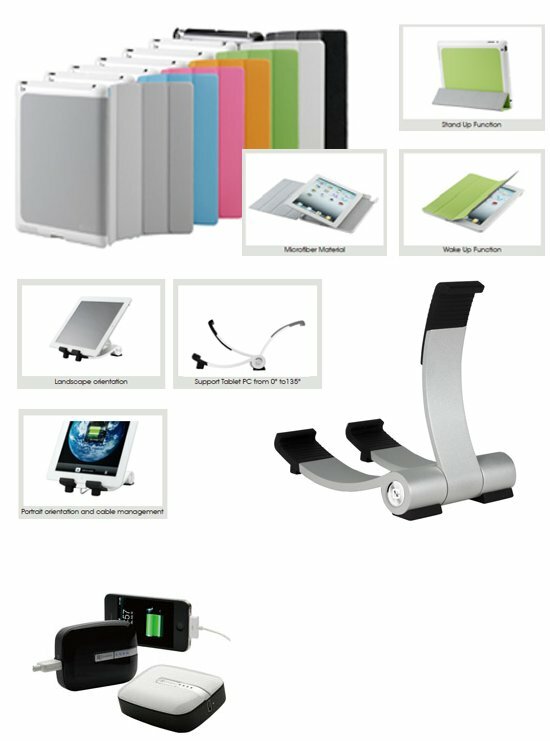 Wave Stand is constructed from high quality aluminum. It is a foldable universal tablet stand that is designed with a dial wheel function for quick adjustment. The central arm is easily adjusted to meet a user’s needs. Through this, PC users will be able to find a viewing angle that is similar to their home screen. This allows a user to have the ability to achieve a natural view in landscape or portrait orientations. Click here for more details. Power Fort 5600mAh – developed as the newest addition to a suite of external battery packs for your mobile products. It contains a special USB charging port that offers lightning fast charging via its 2.1A USB port. Expect your Power Fort 5600mAh to charge smartphones up to 2-3 times on a single charge. It also is compatible with tablets, Bluetooth headsets, and handheld games that utilize a USB charging cable. Bulky, and otherwise heavy, power adapters and cables can be left at home while a user travels light with portable power products from Cooler Master. Click here for more details. The Wake Up Folio, Wave Stand, and Power Fort 5600mAh are available exclusively through the Cooler Master Online Store at cmstore.coolermaster-usa.com.